Imagine your heart breaks. No, I’m not talking about love. Imagine it actually stops working properly. In a matter of days what started out as an innocent fluke turns deadly serious as it just slows down, and then stops. Everything in your life suffers too, all thanks to a tiny electrical glitch. Luckily there are cyborg solutions, and you aren’t completely broken. But gosh, a stiff drink would help during exhausting weeks of treatment, right? Not so. YOU CAN’T DRINK. During Rickey Month. Now it’s really mayday! In the scheme of everything else I’ve been through in the past three months, not drinking alcohol while being medically grounded is really not the end of the world. But it certainly does feel like injurious insult. Over the next few weeks, I’m exploring methods of crafting beautiful non-alcoholic cocktails with some of our finest local bartenders. It’s for all you fellow medically grounded folks out there for whom YOU CAN’T DRINK was yet another slap in the face. And frankly, it’s a nice distraction from feeling like I’ve reached the bottom of the glass. Let’s start at one of my favorite bars, with an old colonial method of preservation that helps add complexity in place of the missing (and much missed) alcohol. Katie Nelson is the gracious and talented doyenne of one of the most lauded cocktail bars in recent years. 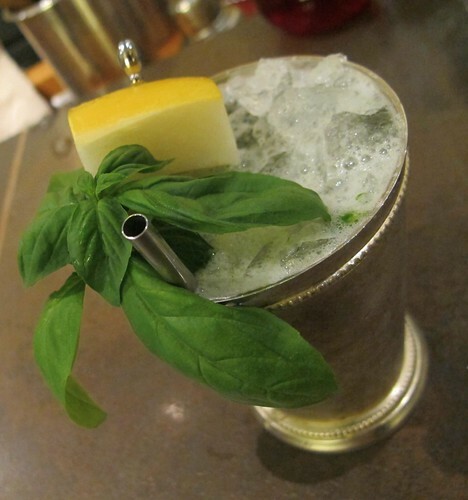 As head bartender for the Columbia Room, Derek Brown’s bar within the Passenger, she’s a favorite here at We Love DC. 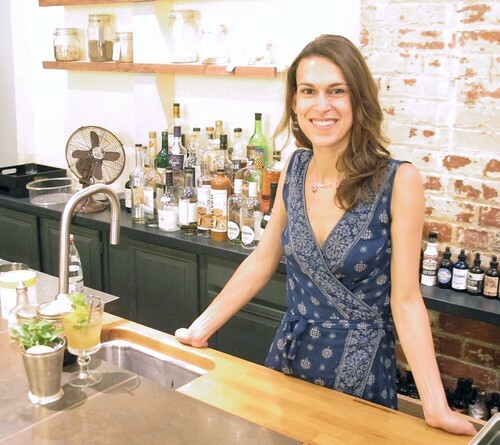 Her passion for fresh local ingredients from farmers’ markets and her knowledge of classic preservation methods, such as shrubs and tinctures, made her a natural start to investigate non-alcoholic drinks. 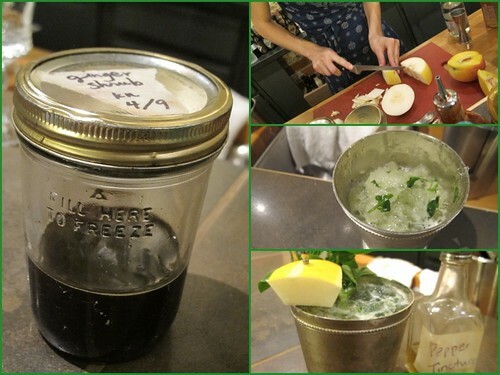 Supplementing her weekly trips to the Penn Quarter farmers’ market with foraging from the Passenger’s rooftop garden, Katie has learned how to keep the taste of summer through the cold months by making a type of syrup known as shrub. “Shrub is an American Colonial technique of pickling a fruit with sugar and vinegar that creates a liquid like a syrup,” she explained. Katie had a few ideas of cocktails to make using shrubs she had on hand from last year, so we headed up to the roof to snip some herbs for garnishing. Conveniently neglecting to warn Katie I have a fear of heights, I followed her up the skeletal insides of the old Victorian building to the ramshackle roof. It’s a bit of a hair-raiser for a vertigo sufferer like myself, but hey! all bets are off now that I’m a cyborg. The reward was a sunny spot filled with containers of herbs and boxes of bees. It’s a charming sight with a view of New York Avenue Beach Bar (and DC Eagle, but that’s another story), just mind your step. 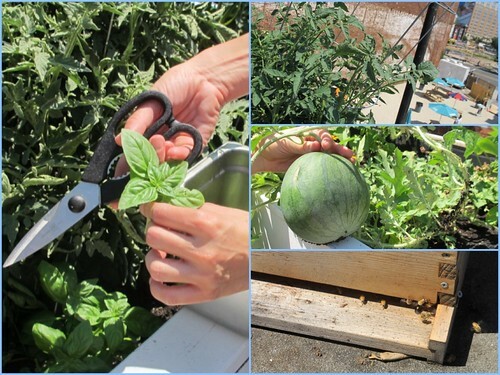 Katie snipped some bright orange zinnia blossoms, a few sprigs of basil and mint, and showed off the squash blossoms and baby watermelons. It was enough to make me start a rooftop garden of my own, except for that pesky vertigo. Luckily before she saw me turn green we brought the bounty back inside to the safety of the Columbia Room. The first non-alcoholic cocktail was definitely both, based on the peach shrub she made last year with champagne vinegar, sugar, and the freshest peaches. 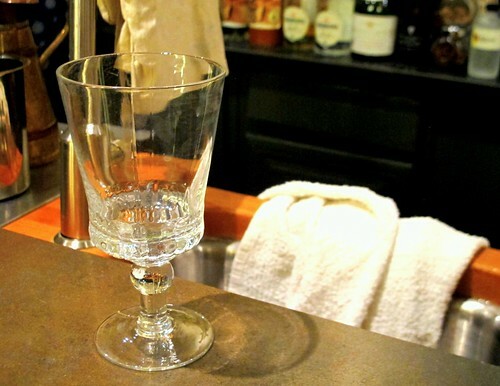 She started by adding about an ounce or so of both peach and ginger shrubs to a glass. The precise amount can vary depending on your personal taste preference for acidity. “It doesn’t have to be perfect,” she said while pounding up ice inside a cloth bag (a trick I am stealing for home). The drink is topped off with Apollinaris sparkling water and a garnish of peach slice, zinnia flower, and mint. The whole effect is that of a peach soda, but without the overt sweetness you’d get from a regular soda, thanks to the shrub’s acidity. The vinegar gives the drink the depth that alcohol would normally provide, fooling your taste buds into thinking there’s an alcohol content. 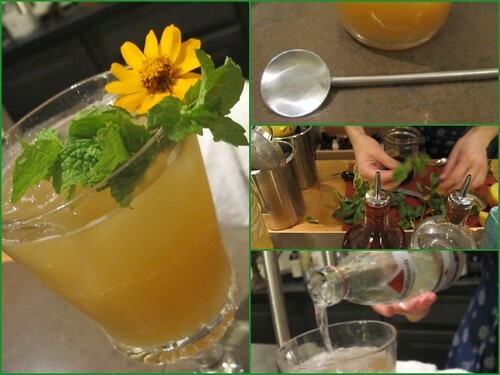 It’s also beautifully aromatic thanks to the mint and zinnia garnish. “If you want to get crazy you can muddle some fresh herbs into the shrub, the sugar and vinegar will break it down a bit,” Katie suggested. Next, I was surprised to see Katie pull out a canary melon, also called sunshine melon at the market, which she then chopped up and muddled with some basil and a little agave nectar. “Agave nectar is good to have on hand already so you don’t have to make simple syrup when it’s hot out,” she explained. Duly noted. “Summer’s all about cold crushed ice,” she said while assembling the drink with ice and bitter lemon soda in a pewter cup. The melon broke down with the other ingredients into a frothy snow cone. As we played around with taste, Katie added pepper tincture and took it up to my favorite level – savory. Using tinctures might be cheating a bit for me as they’re made with alcohol, but you only add a few dashes so I figured it wasn’t too dangerous. Plus they’re as easy to make as a cold tea – just steep the selected herbs or spices with vodka. This second non-alcoholic cocktail was a dream, a farmers’ market bounty with a creamy, vegetal bite. My issue with the usual “mocktail” offerings is that they are often made far too sweet, in many cases too many ounces of sugar and juice. For someone like me who loves savory and bitter cocktails, that just isn’t going to please. Not so with these two drinks. Their sight and aroma were strongly pleasurable and fooled the senses. I stayed and sucked down those two drinks to the bottom of the glasses. I munched on the garnishes. I licked the spoons. I didn’t feel like I was denying myself at all. Heat chopped fruit with vinegar in saucepan over medium-low heat. Once vinegar simmers and fruit has started to soften, remove from heat, purée fruit and vinegar together in a blender, and strain out solids. Return strained liquid to saucepan, resume heating over medium low heat, add sugar and blend until dissolved. Taste to adjust sweetness level, may need more sugar. Turn off heat, let cool, then let shrub sit in a cool place at the very least overnight, but preferably 1 week or more. Many thanks to Katie Nelson, the Columbia Room, and the Passenger.